Visi-Pump by Envirotek Systems is our line of control panel and sewage pumping system. It’s engineered to custom fit any application including grinder, effluent, sewer treatment plant, sump and lift station pumps. 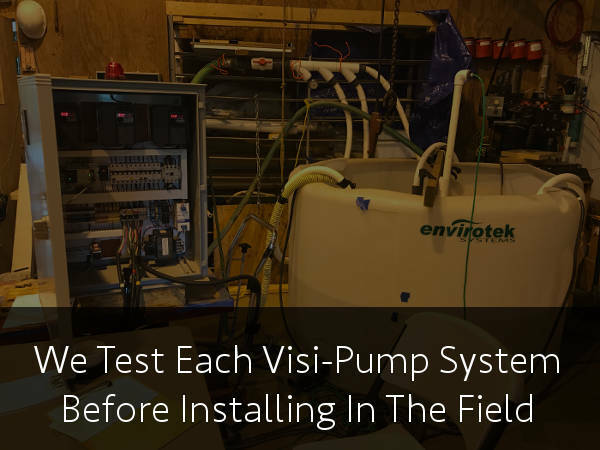 Each one of our Visi-Pump systems are put through rigorous testing in our shop before it’s installed in the field. This ensures the programming and functionality meets our standards of performance. Visi-Pump is controlled and operated by our patent pending technology. Our Control Panels are digitally programmed to operate the pump based on the specific application. This technology fuels our pumps with endurance, durability and a lifetime of performance. Our advanced technology uses non-mechanical devices and controls. Through programmable logic, we can optimize the necessary performance when needed and reduce overloading the pump when it’s not needed. It was created out of a need of necessity. Trying to find a reliable pump to perform up to our standards was exhausting. Many existing sewer pump brands on the market are notorious for having their parts and components failing continuously. We couldn’t find anything on the market that met or exceeded our grade of quality components or deliver up to our standards of performance. With that as our circumstance, Visi-Pump was born. When you’re ready to experience a pump that offers superior performance and reliability, choose Visi-Pump. 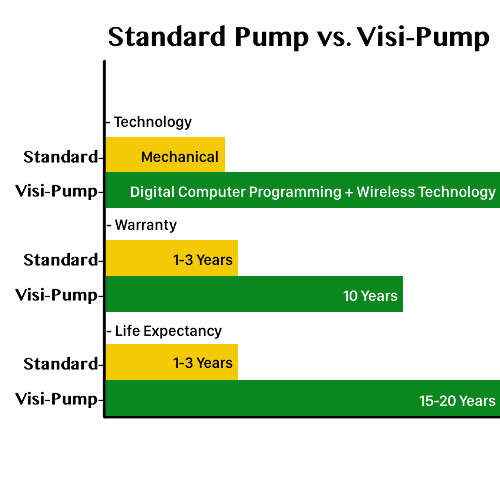 Compare common issues of “standard” sewage pump systems to “our” Visi-Pump system. Standard pump systems fail because they often do not have the correct pump curve for the application. You cannot change or adjust the pump curve with standard pump systems. Standard systems often have either too much flow or not enough flow for the pressure they are pushing against. This causes high temperatures and wear, which lead to pump failures. With a Visi-Pump System, the pump curve is adjustable and is always tuned to best match the application. We test each system in our research and development facility based on the projected operating conditions of your application-before we install it. When our system is installed, our technicians determine the final optimum operating parameters for both flow and pressure and adjust the system accordingly. Standard pump systems utilize mechanical components to protect against high electrical current. These components do not disconnect the power to the pump motor until it has reached an extremely high temperature. This allows the pump motor to constantly overheat leading to premature failure. We utilize electronic components to protect against high electrical current. We have not experienced a high electrical current condition with our system. However, if it should ever occur, our electronically monitored current protection system will disconnect the power to the pump motor immediately, before it ever reaches a high temperature or high current condition. This functionality provides an alert to the condition. Standard pump systems utilize motors which require additional mechanical components to help them develop enough torque to start. These components build up an extremely high charge of electrical current to start the motor which leads to premature motor failure. Our systems utilize motors with built-in high torque. No additional mechanical components are needed to start our pump motors. Our motors are never subjected to high current to help them start. Standard grinder pump systems utilize traditional cutter blade assemblies which are prone to clogging. This leads to high current conditions causing high temperatures, which lead to pump failure. Visi-Pump grinder pump systems utilize a proprietary cutter assembly operated by computer aided electronic controls. We have never had a clog with our system. However, if a clog should ever occur, the electronic monitoring controls will disconnect the power to the pump motor immediately, never subjecting our motor to high current conditions. This would then provide an alert to the condition. Standard pump systems generally utilize mechanical controls to tell the pump when to start, stop and to provide an alert to a high-water condition. They are subject to failure due to water infiltration, high electrical current conditions and entanglement within the pump basin. They often become inoperable due to debris build-up within the pump basin. Additionally, they require extensive labor to move them to different operating positions. Our system utilizes computer aided electronic controls to tell the pump when to start, stop and to give an alert to a high-water condition. These controls are not subject to water infiltration, high current conditions and do not become inoperable because of debris build-up. Additionally, if the on/off or high-water alarm positions need to be changed (for instance, if you install a washing machine that discharges more gallons per minute), it can be accomplished quickly and easily from the touch screen controls without the mess and extensive labor required to move mechanical controls within the sewage basin. This is because Visi-Pump does not have any mechanical controls! Standard pump systems seldom provide any options for how often and how much the pump system discharges. They are normally configured to turn the pump on and off at specific levels solely based on a demand basis. They always pump a large volume of water each time they operate. This can often cause a discharge overload condition leading to failure of a soil absorption dispersal system or a community sewage treatment facility. A discharge overload condition can also develop into drinking water or recreational water contamination. None of these systems provide an alert to a low-water condition, which would indicate a leak in the sewage basin capable of contaminating the ground water aquifers. All of our systems provide precise quantities of time-dosed discharged effluent. This eliminates overloading of soil absorption dispersal systems and community sewage treatment facilities protecting our valuable drinking and recreational water supplies. Additionally, our systems come with a low-water level alert which protects our ground water aquifers, should your sewage basin develop a leak. Standard pump systems utilize mechanical switches in the control panel to select between operating the system automatically or manually. These switches are prone to failure. Visi-Pump systems do not utilize any mechanical switches. Our unique system incorporates electronic switches which are accessed through the convenient user-friendly touch screen. Users can test the operation of their pump and alarms through the touch screen just like you would if you were using your smart phone. Standard pump systems have no external visual indicator as to the liquid level within the pump basin. You must physically remove the basin lid to see the liquid level. All Visi-Pump systems utilize a touch screen on the outside of the control panel which conveniently displays the current liquid level status within the pump basin. Standard pump systems will sometimes have mechanical switches to test the pump and alarm operation. The switches are often located inside the control panel making it inconvenient as well as risky (exposure to live electrical terminals) to access them. All Visi-Pump systems have the pump and alarm test feature conveniently located on the touch screen on the outside of the control panel. There are no problematic mechanical switches used. Additionally, the electronic touch screen switches ensure that there is no exposure to high voltage circuitry. No standard pump systems have the capability of self-cleaning. All Visi-Pump systems have a proprietary self-cleaning basin feature. A few standard pump systems offer remote monitoring. However, the feature is limited to alarm monitoring and notification only. They have no remote diagnostic or operation capabilities. Visi-Pump systems offer an optional industry-first remote monitoring, diagnostic, notification and operational feature. Many clients prefer the peace of mind knowing that their system is monitored 24/7. With this feature our staff are notified immediately of any abnormal operational concerns. We also can remedy most concerns without a site visit. Because of the Visi-Pump remote diagnostics option, our technicians are better prepared to correct concerns which require a site visit. Should a client begin using the system differently than the way it was first set up, we can re-program the system remotely to better fit the new use pattern. If a client has determined they wish to have the system non-operational because it will not be in use for an extended period, we can shut the system off remotely. Should we notice excessive water usage, we can notify the client so they can correct the problem. For instance, leaking toilet tank flappers may be allowing excess water into the system. Standard pump systems seldom come complete with the proper plumbing components. It is left to the installer to determine what to use. Pump systems need to be watertight against infiltration and exfiltration. The components necessary to obtain water-tightness are never furnished with standard pump systems. An inexperienced installer will often make poor choices regarding plumbing connections, resulting in system failure. Additionally, an inexperienced installer’s lack of knowledge regarding soils and compaction will lead to system failure. Visi-Pump systems are only available through Envirotek Systems. Our systems utilize only tried and true plumbing components, some of which are proprietary. Our technicians have years of field experience regarding the selection and use of water-tight components as well as proper methods of soil and aggregates compaction which prevent settling failures. Standard pump systems do not come with instructions on how to determine whether the correct electrical supply is present. Neither do they come with the proper electrical connections needed for a corrosive and wet environment such as a sewage basin. Inexperienced installers often make poor choices regarding the electrical power supply and connections. This leads to system failure while often creating an unsafe condition, subjecting themselves and others to a potential tragedy. Additionally, these installers are generally unaware of how to select and manage the proper settings for the system controls and devices resulting in system failure. Visi-Pump systems are only installed by Envirotek Systems. We are the only pump and controls system manufacturer that also installs and services our own products. We understand the do’s and don’ts of sewage pump electrical power supplies, connections and controls. We test every system we build in our research and development facility based upon the same conditions it will be used in your application-before we install it. During the actual installation, more fine-tuning of the electrical controls and settings are performed. Our electrical engineer works closely with our field technicians to ensure that your electrical connections are reliable and safe. Standard pump systems do not come with instructions on how to deal with sewage gases. Neither do they come with adequate sealing devices to ensure that no dangerous corrosive sewage gases enter your electrical control panel or home. Inexperienced installers often are unaware of the importance of dealing with these corrosive and deadly gases, resulting in system failure and often subjecting themselves and their clients to these gases. At Envirotek Systems, we understand the importance of correctly dealing with and managing dangerous sewage gases. Our technicians take meticulous steps to ensure that no sewage gases enter your Visi-Pump control panel or your home because of our system installation. All Envirotek Systems technicians are trained in confined space entry and have at their disposal the necessary safety equipment to enter confined spaces when necessary. Standard pump systems generally warranty only the pump, not the controls. These warranties can range from a few months to a few years. None provide coverage of the complete system. None provide any labor warranty. Residential Visi-Pump systems come with an industry-first ten-year full parts and labor warranty. *10 year warranty subject to system’s existing design.